Boomerang Kids Drive Rise Of Extended Family Living A new study finds that the number of people in multigenerational households grew by 2.6 million between 2007 and 2008. The trend is fueled by young adults, but older adults are also slightly more likely to share households. Another factor is the increasingly large share of immigrants living in the U.S.
As jobs have disappeared and houses have been foreclosed on, many Americans are sharing space to save money. A new study by the Pew Research Center found the number of people in multigenerational households grew by 2.6 million between 2007 and 2008. But the bad economy isn't the only reason more homes are filled with several generations; the trend has been under way since 1980. In a roomy townhouse in Northern Virginia, the Anderson family exemplifies what demographers say is a cultural shift. 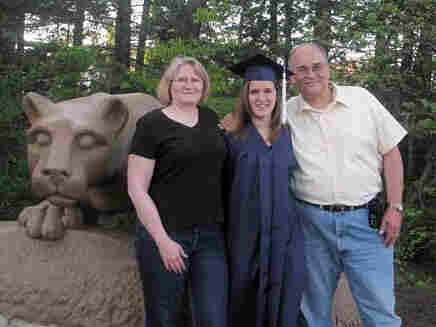 Jackie Anderson, 23, graduated from Penn State last year. Given the horrendous job market, she pretty much planned on ending up back with her mom and dad. These days, she certainly sees no shame in that. "Most of my friends that are from high school are still around this area, and most of them do live with their parents as well," Jackie says. "And I know a good number of them up in Pennsylvania do the same thing." The recession has hit young workers especially hard. But Jackie's mother, Chris, says long before the bad economy, she had always expected her daughter to move back in. "I thought when she graduated she would want to build up enough money to get a place of her own, to get a car, all the things she wanted to live comfortably," she says. The Pew study found that the share of people in multigenerational households has grown by a third since 1980 — to 16 percent of the population — and young adults like Jackie are leading the way. The center's Paul Taylor says baby boomers may have come of age protesting just about every conviction their parents held. But, he says, that generation gap has virtually disappeared among their children, the so-called "millennial" generation. "It seems rather admiring of older adults," Taylor says. Millennials "believe older adults have values that are better than their own. At some level they're becoming buddies with mom and dad, and they may not find it so unusual to still be living in their childhood bedroom." These so-called "boomerang kids" aren't the only ones driving the trend of extended family living. Older adults are also slightly more likely to share such households. Demographers say the generation that gave birth to the baby boomers has a lot more kids to potentially move in with. Another big factor is the increasingly large share of the population made up of immigrants, who are far more likely than native-born whites to live with grandparents and grandchildren. "Particularly among Hispanic families, they are looking for larger-sized homes," says Lawrence Yun, chief economist for the National Association of Realtors. "And some of the Asian communities are just accustomed to living with grandparents in their home countries, so they're adopting it here as well." Yun says home sales were the same last year as in 2000, even though the U.S. population grew by nearly 30 million. Clearly, he says, people are moving in with each other instead of buying their own place. Jackie Anderson recently found a job and is planning to move out ... sometime. "I'm kind of playing it by ear," she laughs. "I'd like to do it maybe around the summer — that's a tentative date." Her dad says she'll have her parents' blessing when she goes, but they like having her around, and they're not going to give her the shove. Earlier versions of this story incorrectly stated that the share of Americans in multigenerational households has tripled since 1980. It has grown by one-third.